These are a cute little project you can make for the baker in your life. This is great for either boys or girls that love to bake or even pretend bake. It won’t take you very long to throw it together. It is cute to keep for yourself, give as a gift or even sell in craft fairs. Whatever you want it to look like, you can make sure to add on. You can create pockets for the outside, add a little decal or even provide frills around the outside for that cute ‘added’ look that some enjoy. I will provide the base for the apron, then you can customize it to your liking. This is a great way to get some experience with the flat apron alone. It is easy and depending on the size of the child, you only need around a half yard of fabric to complete the entire look! You will first want to cut out the straps of the apron. This will be the easiest before you start curving the fabric for the front of the apron. You want to cut out two long straps. You should have four pieces in the end, since you will be fusing these two together. I have a 2 year old, but she fits more like a 3 year old, so her measurements were 22″ around. I then cut this measurement in half and then added on an extra 3″ to provide a longer strap for tying. I cut the original apron area to be 14″ x 16″. You should have your straps and a large block of fabric for the front of the apron. These will all be put together later on down the road. 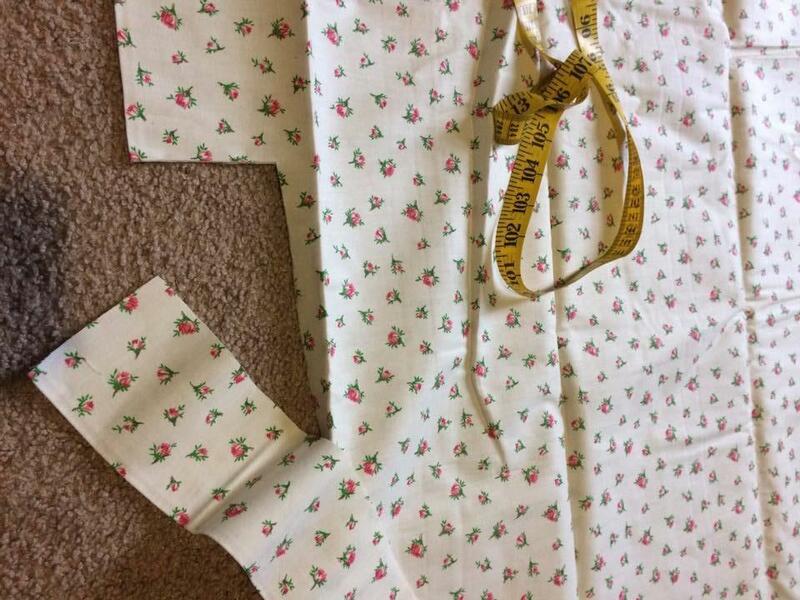 You have to make sure to measure the little one’s waist that the apron is going to go on to get a more accurate size. Of course, you can make the straps longer, depending on how long you want them to be, or you can make them longer so that the apron is able to grow with the child as they get older and bigger. Start with the straps. You will want to turn them so the right sides are facing into each other. From there, you will go around the strap, making sure to leave one of the ends open. You can do a square sew around the end, or you can curve them like I did. Turn the straps right side out and make sure to go around the outsides. You have the option here to do a fancy stitch or stick to the same one you’ve been using. You can also go around the edges that you curved or made square. You don’t have to go around the end that you left open if you don’t want too. This end is not going to show once you’re done. Your straps should look like this when completely finished. You can set them to the side. We are going to work on the front of the apron now. You will want to go around the large square that you cut out for the front of the apron. Choose one end of the apron front and make it more circular. This will give off the apron look when it is all pieced together. Turn the apron so that the right sides are facing into each other. Go around the outside, leaving the flat top together. Start at around 4-6 inches below the top of the fabric, so that you swoop around the circular bottom of the apron but not the top of it. It should look like this, with the flap at the top being able to be folded down and over. Leave the apron turned with the right sides in. You are going to attach the straps to it now. You will want to have the straps folded up on the inside with the ends of them sticking out of the sides of the fold. This is where you’re going to sew. Have them out just an inch or so, no more. You can then pin them in place. It should look like this when you have it all pieced together correctly. You then want to go all the way around the outside of the fabric, taking care to make sure that you sew where the straps are, but don’t catch the rest of the strap in the stitch. Make sure to leave a small opening at the top of the apron for when you need to flip it back out the right way. Once flipped back out, you can then go around the outer edges creating a decorative look to the outside of the apron. They’re going to love wearing this whenever they actually cook or even pretend cook! It is cute and you can personalize it anyway that you choose!